Review What's free, looks like Mac OS X, just works and is actually Linux? The answer is gOS, which recently launched a new beta that builds on the distro's initial success and adds new tools like integrated Google Gadgets for Linux. When it launched onto the scene late last year, gOS (which stands for good OS) made quite a splash for getting Linux into the U.S. retail giant WalMart. Through a partnership with PC manufacturer Everex, gOS brought Linux to your parents' generation via WalMart. But chances are, if they picked up a gOS equipped machine, Mom and Dad would have no idea they were running Linux. Like the Xandros distro that Asus packages with the EeePC, gOS doesn't trumpet its open source credentials or advertise its infinite customization options. It just works. That's part of what makes gOS "Linux for the rest of us." The distro isn't intended to be powerful, nor is it a desktop package from a company that makes its real money off server installations as many Linux distros are. For Linux purists and those that enjoy spending hours fiddling with configuration files, gOS will be an utter disappointment. But gOS isn't aimed at hard-core Linux users. It's aimed at otherwise computer illiterate users who simply want an easy way to check e-mail, browse the web and share some photos online. That's why gOS is marketed mainly to OEM partners like Everex or Sylvania. You're most likely to encounter it in a netbook or other lightweight "internet appliance." The emphasis in gOS is on web apps and everyday tasks like browsing the web and checking e-mail. Under the hood, gOS is based on Ubuntu, but aside from that familiar startup sound, you're unlikely to notice the Ubuntu underpinnings. Administration tools are decidedly lacking in gOS, but that's expected since it isn't part of the distro's plan. While Ubuntu does a nice job of balancing user-friendliness and power, gOS simply tries to make things as easy as possible for the end-user. If that comes at the loss of what longtime Linux users consider very basic tools, so be it. gOS is aimed at those who don't have slightest interest in power, they just want to use their PC. gOS is also notable for embracing proprietary software. The original release shipped with Wine pre-installed and used Picasa instead of the traditional Gnome photo manager FSpot. The latest release continues that trend, shipping with Wine 1.0 to make installing Windows apps easier and Google Gadgets for Linux are also pre-installed. 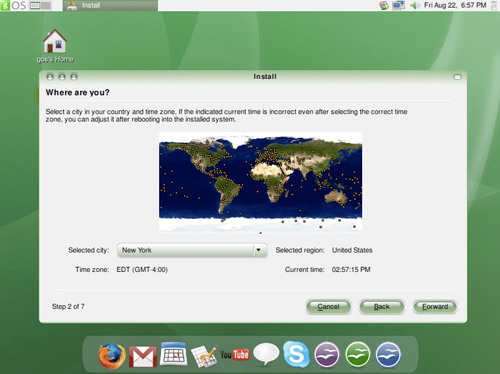 Once the system is installed and rebooted, you'll be greeted by a cheerful, bubbly, green interface that's closer in appearance to Mac OS X than other Linux distros. As soon as gOS loads, you'll see the new Google Gadgets sitting off to the left of the screen, not unlike the Gadgets shelf that ships with Windows Vista.